Bob Warming says he will never be the guy he was before his 21-year-old daughter, Audrey, died in a car accident on April 15, 2012. Warming, who is about to start his fourth season as Penn State’s head men’s soccer coach, says the most important lesson he has learned from the tragedy he and his family have experienced is to reach out to people who are suffering from losses. Starting in January, Warming, unfortunately, has had an opportunity to help a fellow father who also has suffered the loss of a child. Christian Brady, dean of Penn State’s Schreyer Honors College, loved attending Penn State soc- cer games with his son, Mack, who had dreams of being a goalkeeper for the Nittany Lions and, perhaps one day, the US national team. But on December 31, 2012, just 16 days shy of his ninth birthday, Mack died from a blood infection. Brady adds that he doesn’t feel he has all the answers for why tragic events, such as losing his son, happen — and it’s partly there where he and Warming have connected. The two were acquainted with each other thanks to the Bradys’ attending many of the Nittany Lions’ soccer matches. Brady had even chatted with Audrey several times after soccer practices or other events. Since Mack’s passing, Brady and Warming have become closer and usually talk once a week and will meet for cups of coffee. From the two losses, two special efforts have been organized by the families — both based around soccer. After Audrey’s death, the Warming family decided to help struggling children in Omaha, where Warming had coached for 14 years at Creighton University, turning the program into a national power. Audrey’s Shoes for Kids helps provide soccer shoes and funding for kids from the Omaha Housing Authority who attend the Kicking with the Jays soccer clinic that the soc- cer team at Creighton hosts. At last year’s clinic, 150 pairs of soccer shoes were given out to kids ages 8 to 18, many of whom come from refugee families from Sudan and Ethiopia. The organization does exactly what Audrey did for much of her life — help people in need — and the idea came from a conversation she had with her father. During a drive to Pittsburgh with Audrey shortly before her death, Warming and his daughter had noticed several billboards promoting the lottery and how many millions of dollars someone could win. They began talking about what they would do if they had won all that money. Audrey recalled volunteer work she had done in Omaha, including helping a youth soccer clinic the Creighton men’s soccer team (then coached by her father, who started the clinic) held. She had noticed kids participating in the clinic wearing flip-flops, because they were the only pair of shoes they had. She told her father that if she won the lottery, she would like to do something to help those kids. When Audrey died, the Warming family — Bob, Cindy, daughters, Emily and Bess, and son (and Audrey’s twin brother), Grant — knew they wanted to something in Audrey’s name. Bob Warming remembered the conversation he and his daughter had had about winning the lottery. The organization was set up, and fundraising started immediately. Last August, the clinic was held and the 150 kids who attended received free soccer shoes, shin guards, and socks with the letters ASK (Audrey’s Shoes for Kids) on them. On August 17, the second Audrey’s Shoes for Kids clinic will be held, and not only will the en- tire Warming family be there but also the Penn State men’s soccer team, who are playing an exhibition game that night against Nebraska-Omaha. Family is centrally important to the Brady family, as well. Even to the point where Mack Brady’s older sister, Izzy, can still speak honestly about him. Similar to the Warmings’ feelings for Audrey, the Bradys wanted to do something positive in Mack’s name. They began talking about it on the drive back from Hershey, where Mack had been taken when he was diagnosed with the infection. Mack began playing soccer when he was 4. It became a passion for him. One memory Mack’s mother, Elizabeth, has is of the two of them watching a Women’s World Cup game, and US keeper Hope Solo diving sideways past an opposing player and grabbing the ball. “Would you do that?” Elizabeth asked Mack. “How much do you want to bet me?” Mack answered. They agreed to $50, and at one of Mack’s next games, he made a move similar to Solo’s for a save. When he came to the sidelines, he reminded his mother of the bet. “He was always up for the challenge,” Elizabeth says. Despite the devastating loss of Mack, the Bradys were up for the challenge of organizing the fund in Mack’s name. Christian called Bob Warming on New Year’s Day, the day after Mack’s passing. They found out they needed $50,000 to have an endowment. Christian had a goal of reaching that figure in a year or a year and a half — they achieved that mark in a week. In addition, Penn State’s men’s and women’s soccer teams held a youth clinic in Mack’s name shortly after his death. The two teams also will each have a “Mack Brady Game” this season — the men’s game is September 13 against California and the women’s game is September 27 against Purdue. Christian says that people mourn their dreams and wishes. Mack’s dreams of playing for Penn State’s soccer team and being a goalkeeper on the US national team are gone in one sense, but alive in another. As Elizabeth Brady says, unless you’ve been through the loss of a child, no one exactly knows how to grieve. 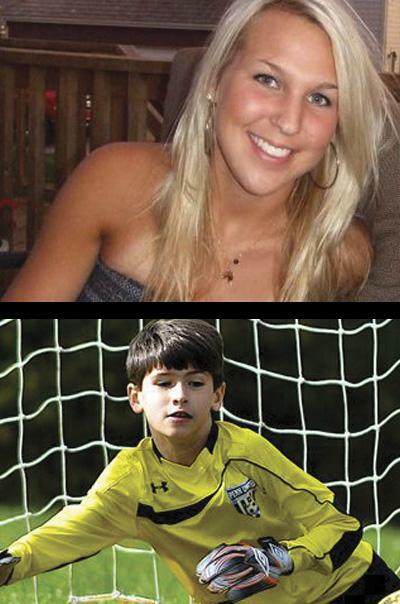 The Warming and Brady families continue to grieve, but have found that the energy and passion for life their respective children had is living on in, among other things, Audrey’s Shoes for Kids and the Mack Brady Soccer Fund, respectively. Even with those special efforts, however, the weight of the losses remains.